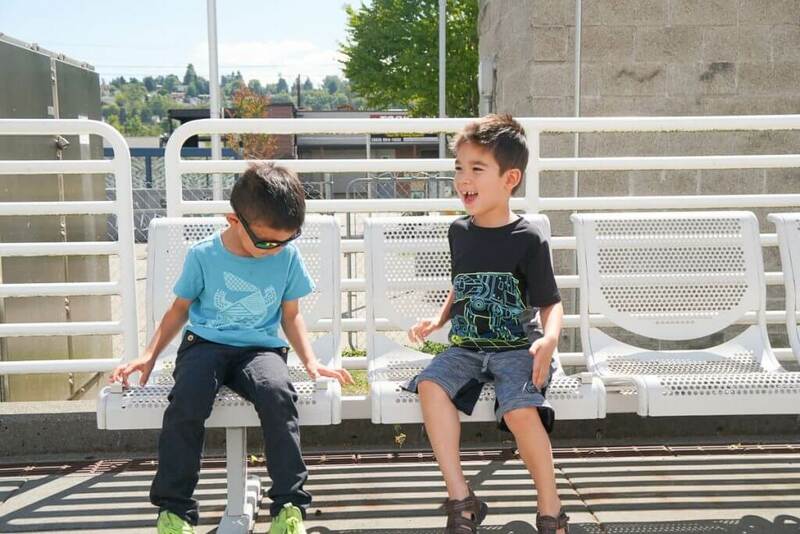 The main attraction of our Seattle train play date was the train ride itself. So, we chose to meet at Kent Station. That way, the kids would get about a 30 minute ride each way. Plus, we figured we’d find parking there easier than at the other stops where more commuters park. I’d recommend parking on level 5 of the parking garage because that’s the level with the skybridge over to the station. Walk all the way to the end of the skybrige to take either the stairs or elevator down to the tracks. We didn’t see any signage where to go. But, we talked with a security officer who said usually there’s a station master who announces which trains are on which tracks. When you get down to the tracks, you’ll find some machines to purchase your tickets. 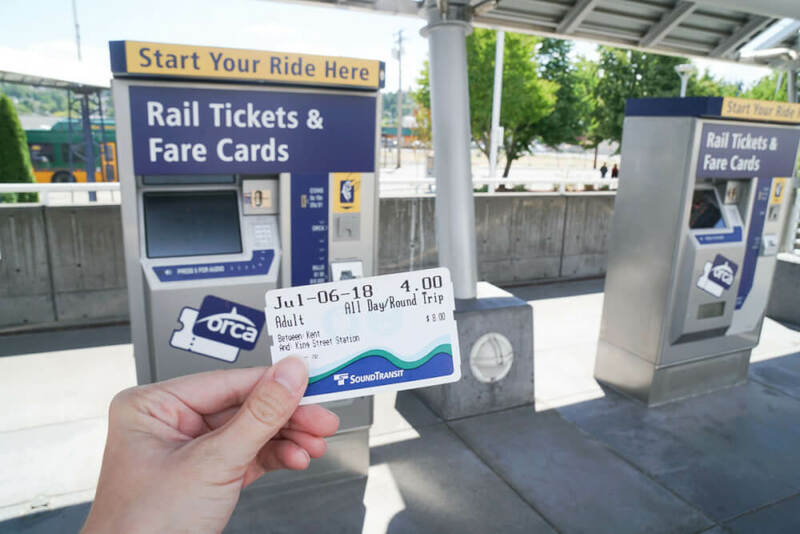 Kids ages 5 and under are free, so I just had to buy myself a round trip ticket to Downtown Seattle. It was $8 total. 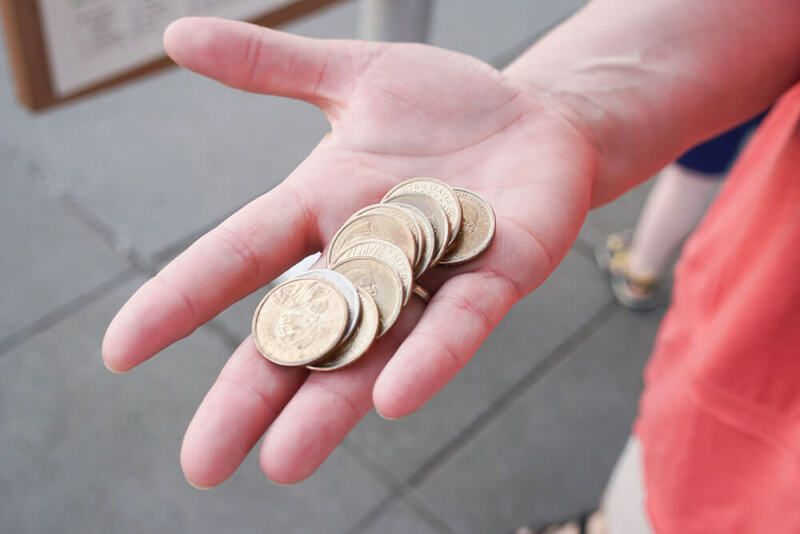 So, a quirky thing we discovered is that if you pay cash, the machines at Kent Station will give you $1 Presidential coins as change! But, we’d suggest paying with a $10 rather than a $20, to avoid lugging around such heavy money! Insider Tip: Kent Station is a shopping center. If you wanted to extend your outing, you could always catch a movie or enjoy some ice cream there. We took the 11:05am train from Kent Station in hopes that we would avoid commuters. It was perfect timing! The kids were able to find window seats easily. We had 5 kids with us and they sat in one section and the parents sat across the aisle for the trip to the International District. The train was really quiet and the ride was really smooth. And the train was really clean! The kids sipped their water bottles and eagerly looked out the window to see the sights. The ride from Kent Station to King Street Station took about 30 minutes. During that time, few people got on board, so we had a lot of room to spread out. And there was plenty of space for my stroller and tote bag. 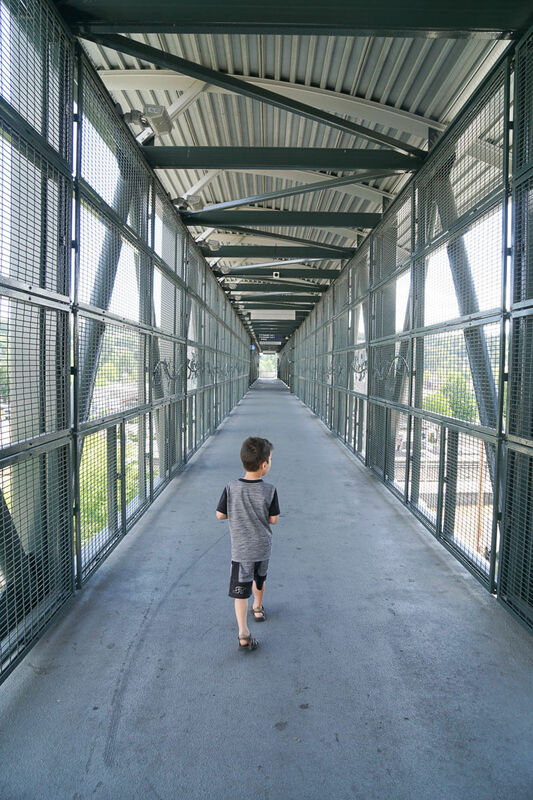 Insider Tip: Sit on the left side of the train to get views of Boeing Field and the Museum of Flight on your way to Seattle. 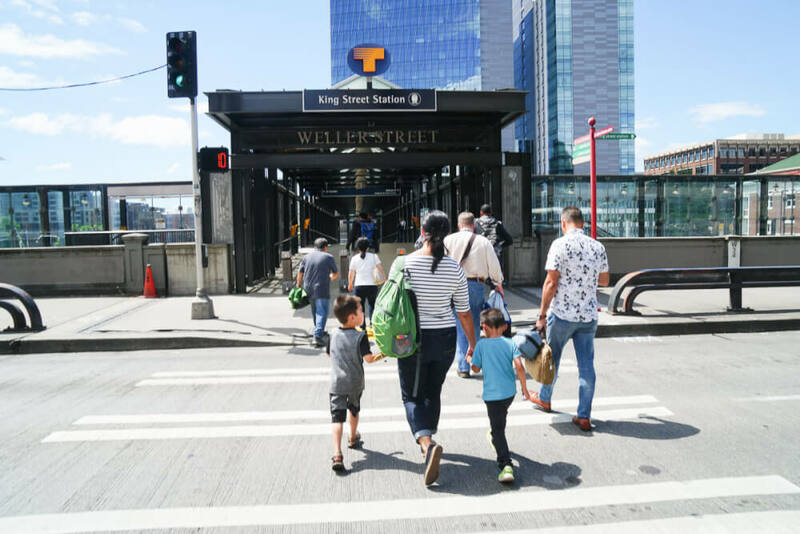 We chose to get off at the International District because it’s right at King Street Station. One of my friends and I are pretty familiar with the area and knew where to go. And our two other friends hadn’t explored this area, so we thought it would be a fun stop. Since there were 4 families with varying taste buds, we decided to head straight for Uwajimaya. It’s a large Japanese grocery store that has a food court. 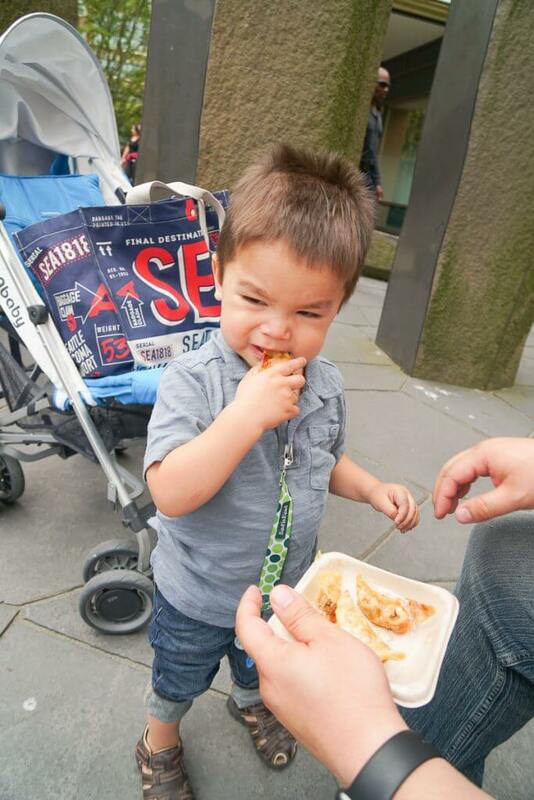 The food court options include Chinese, Japanese, Thai, Hawaiian, grilled cheese sandwiches and more. Plus, Uwajimaya has a grab and go section of their store near the food court. I grabbed a BBQ pork musubi, shrimp tempura musubi and some potstickers from the grab and go area. Then, I let the kids pick out some rice crackers, cookies, and rainbow mochi that we could share with our friends. It’s also a great place to find all kinds of Asian candy and baked goods. The food court area gets really crowded at lunch time and it would have been near impossible to find a table where all 10 of us could eat. 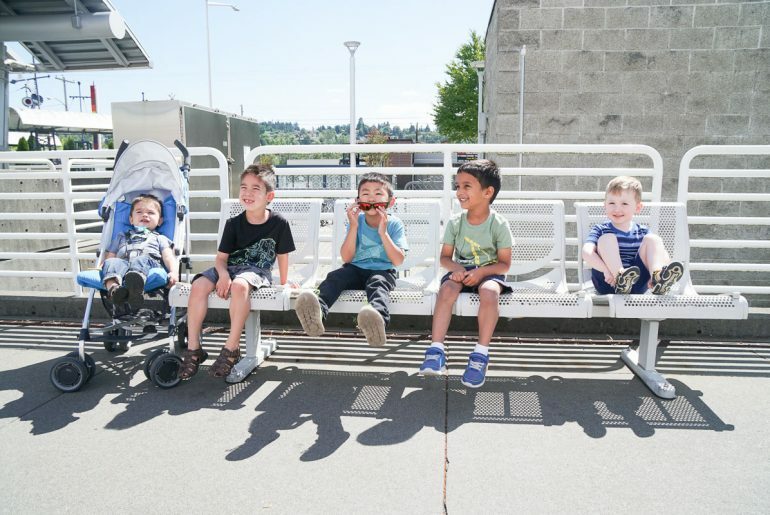 We happened to go on a beautifully sunny Seattle day, so we took our food to eat outside. In between King Street Station and Uwajimaya, there’s a courtyard with tables, chairs, benches, etc. In fact, there was a woman stretched out on one of the rocks soaking up the Seattle sunshine when we were there. It’s an awesome spot to sit and enjoy your food. Oh, and Starbucks is right there! 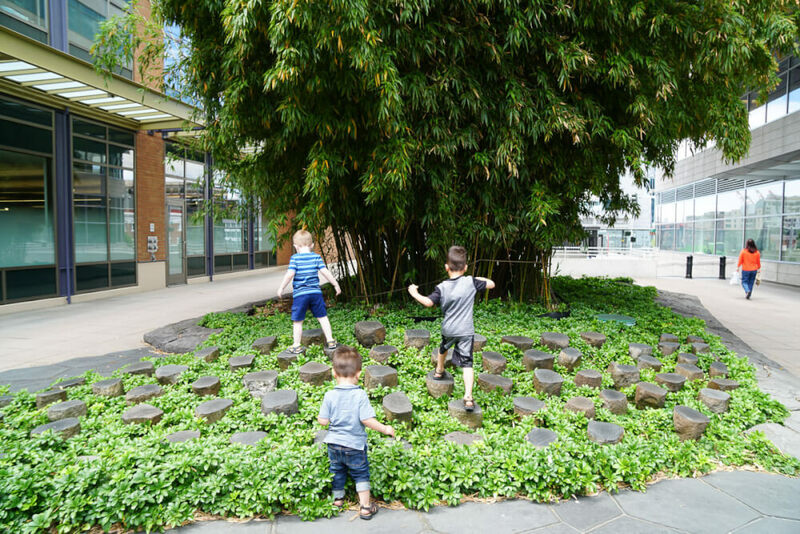 When the kids were done eating, they had fun running around and exploring this little bamboo forest area. This was awesome because it bought us enough time to eat the rest of our lunch and plot out our next move. Our next stop was to go play at a park. The Donnie Chin International Children’s Park is on Lane Street just a few blocks from Uwajimaya. It was renovated in 2012 and has some cool play equipment. When I was in 3rd grade, our teacher took us on a field trip to Uwajimaya and I remember we went to a park with a dragon sculpture. I hadn’t been there since, so when we arrived, I was flooded with lots of fun memories! 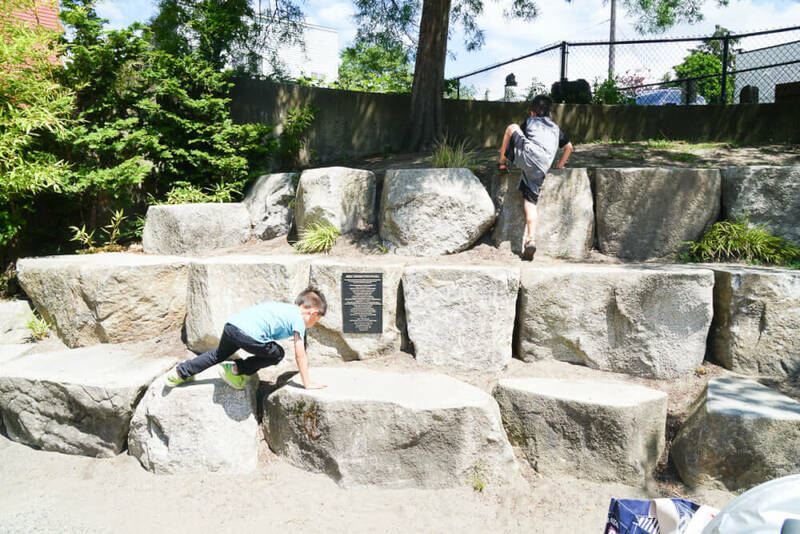 Not only that, but there are some rows of giant rocks that form tiers where kids can climb up to the top. My 4 year hold had no problem climbing up and down but my toddler was too short. As the rocks are secured in dirt, our kids got super dirty climbing up and down in the dust! 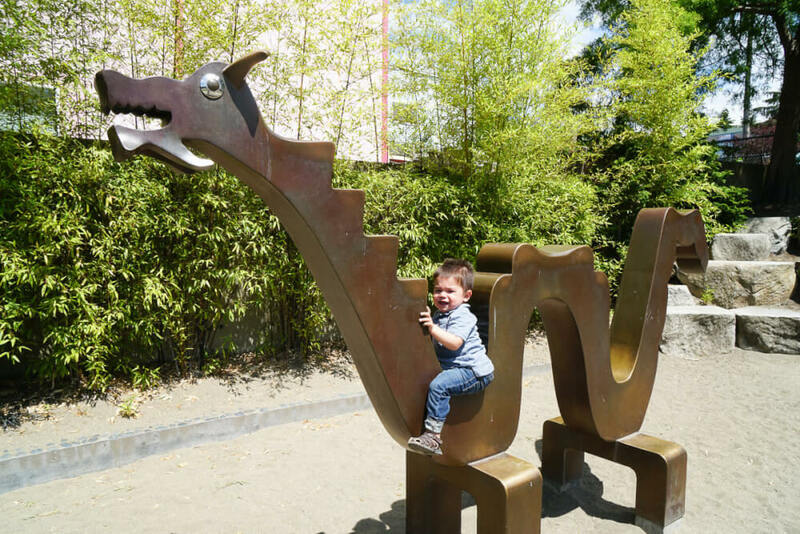 But, the piece that really stands out is a dragon sculpture that kids can climb on. After seeing the older boys posing for photos on it, my 21 month old begged me to let him “ride” the dragon so he could pose for photos, too! My top tip for playing at this Seattle Chinatown park is to bring baby wipes or a towel. Your kids will get dirty with all the sand and dirt. I had to dust mine off a bit. But, there is a drinking fountain at the park that we used to wash hands. What Else to do in Chinatown? Even though Seattle’s Chinatown is pretty small, there’s a lot to do here. You could easily spend the whole day exploring. And if you have older kids, there are some interesting museums. The Wing Luke Museum has lots of new exhibits, so it’s somewhere you can revisit from time to time. They’ve been doing a whole Bruce Lee series that looks cool. 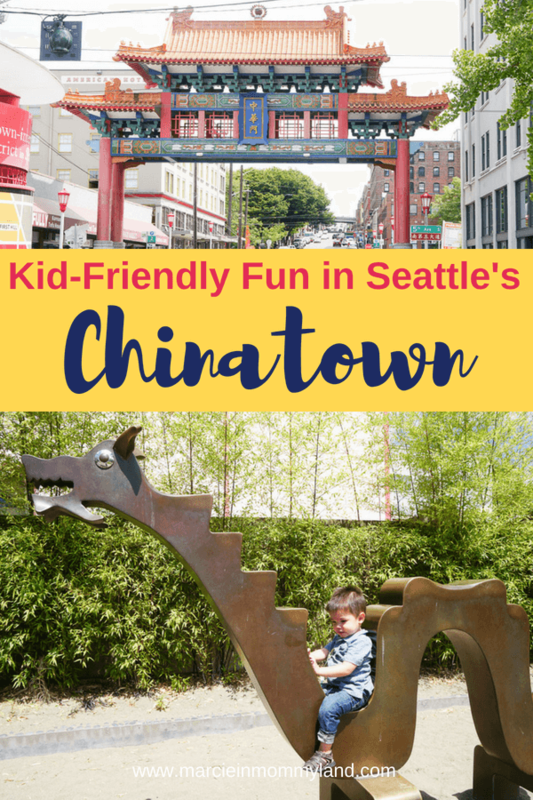 Plus, it’s a great place to learn about the history of Seattle’s Chinatown. It’s a small museum, so it doesn’t take much time to walk through. For kids ages 7 and older, this is one of the coolest stops in the International District. Basically, you pay admission and then you can play as many old school pinball games as you’d like. And they sell vintage soda you can drink while playing. The games even have cup holders! This is one of our favorite places to pick up yummy treats. Personally, I like to get a sponge cake (or two) and several fruit tarts. And they also have pork buns that are easy snacks/lunches for kids. They only take cash, so be prepared! If you like BBQ pork, this is the BEST spot to pick some up. They chop it up right in front of you. We always get it to go and then eat it for dinner (and then lunch) at home. The train ride from King Street Station was much more crowded. We took the 2:35pm train on a sunny Friday afternoon in Seattle. Anytime we have good weather in Seattle, people tend to leave work early! We had a bit of trouble finding our friends on the right platform. Thankfully, they are clearly numbered and we found them before getting on the train. The Sounder is a double decker train (cool, right?) My friend headed upstairs immediately, but the upper deck was already full. I should note that the King Street Station is South of the Downtown stops, so it makes sense that it would be full. I folded up my stroller and stashed it behind my seat. But, there were enough seats for all the kids and adults. The train ride back was still fun for the kids and they were all asking when we could do it again! Oh, and most of them fell asleep minutes after getting into the car. That’s a successful play date in my book! Take full advantage of this! When you think about parking costs in Seattle, it’s much cheaper to buy a Sounder ticket for $8 that’s good all day. 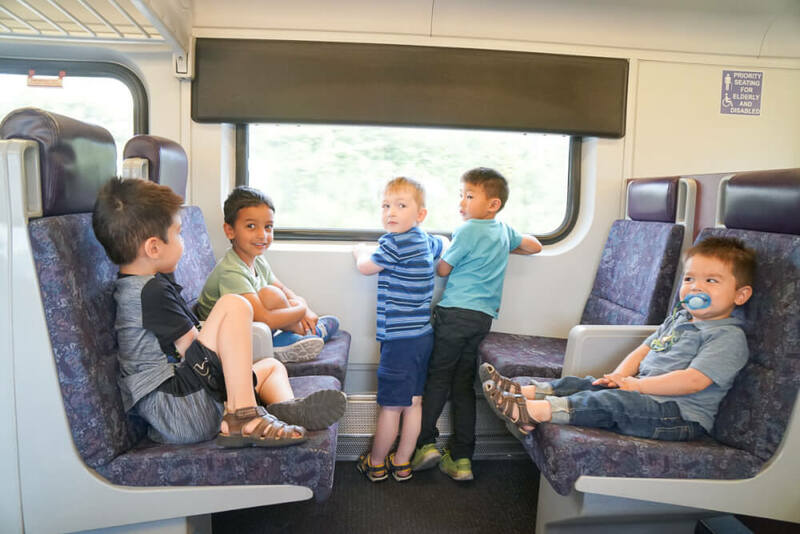 And if you’re just looking for an easy train ride to do with kids, this one is pretty affordable and is a good length for little ones. There are elevators located at the train stations. The tricky part is getting your stroller up onto the train itself (if your child is sitting in it) since there are 2 steps. If you go with friends, ask one to help you carry the stroller up. Once you are on the train, you can park your stroller in one of the handicap seats. Remember to lock your breaks! If you are bringing a folded up stroller to use once you get to Chinatown, you can also stash the stroller in available handicap spots or there’s an area for bikes. If you are parking in the Kent Station Garage, note that level 5 is where the skybridge is. I found it so much easier with a stroller and little kids to park on the same level. Unfortunately, the Sounder is a weekday commuter train. That means it usually doesn’t run on weekends. And when it does, it’s usually for sporting events. Take the 11:05am train from Kent Station to King Station. Then, take the 2:35pm train back from King Station. The upper deck fills up quickly. With this timing, you should avoid most of the commuters so the train will be more vacant. I was in Seattle over the July 4th weekend and feel absolutely in love with the city. There is so much to do. Loved it. Oh yay! And we had awesome weather that weekend! Seattle is definitely a place I’d love to visit with my family someday. There looks like there’s so much to do with kids!! It’s an incredible city that’s definitely worth a visit! What a fun adventure! 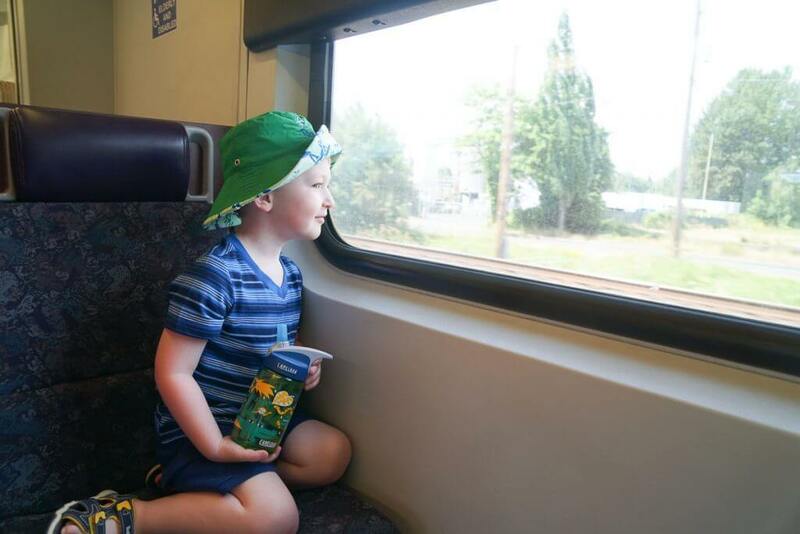 Train rides are awesome, especially for kids. And Chinatown seems like a great place to explore. It’s just big enough that it’s an adventure, but not overwhelming! Love little play date adventures like this with other mom’s and their kiddos. Sounds like it went really smoothly too. Thanks for sharing. Yes, the kids were tuckered out by the end! Oh yay! I have a bunch of posts about fun things to do in Seattle! Summer is the PERFECT time to visit! They had the best time ever! Who knew commuter trains would be so fun? This sounds like a wonderful activity for the day with kids. Next time I am in Seattle I will be sure to check out this adventure! It’s a lot of fun and Sound Transit makes it pretty easy! 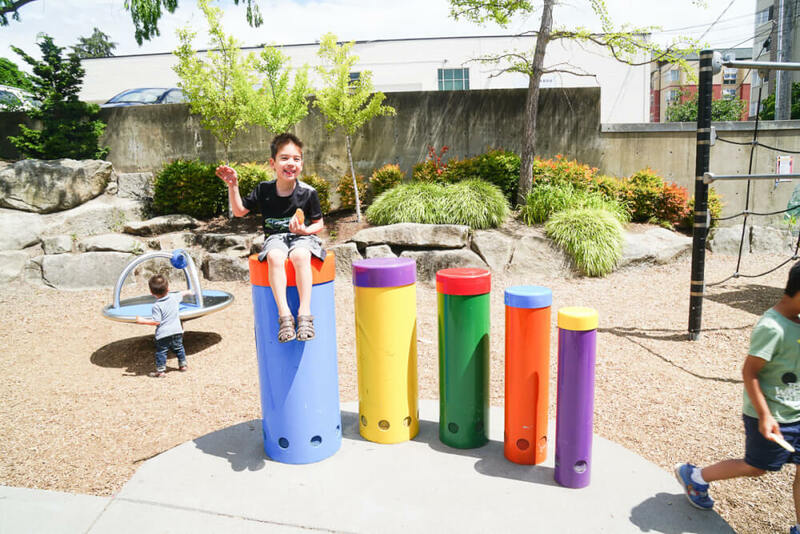 There are so many fun things to do in Seattle for all ages. Your train trip sounds fabulous for the littles. My kids loved to ride the train and that courtyard and park would keep my child entertained for a long time. We were surprised how easy it was to just walk around and explore! This looks like so much fun! I have only been to Seattle once, but hope to visit again. I will definitely have to check out Chinatown next time I’m there. The Pinball Museum and Cakehouse sound right up my alley! And who doesn’t love a train ride?! Thanks for sharing! Yes, please do! It’s a pretty cool area! That looks like a lot of fun for the kiddos. I think my niece and nephews would love to do that. 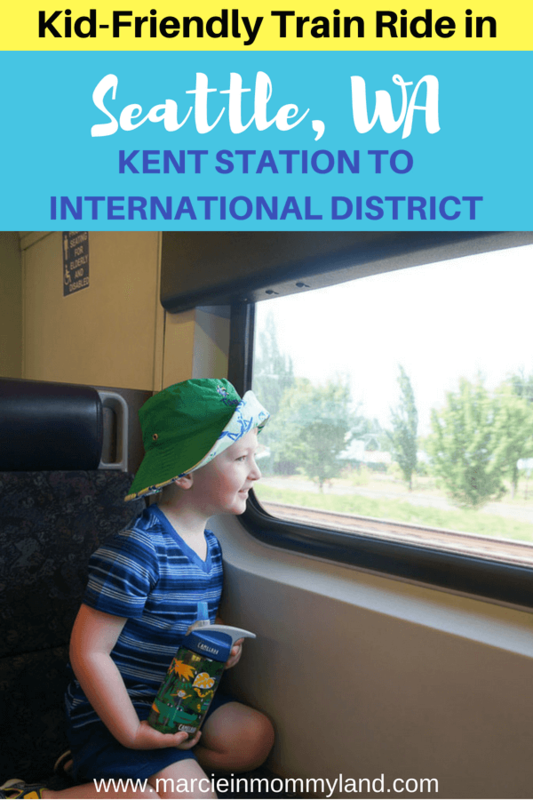 We love taking the train when we travel, so it was fun to do it at home! What a fun play date! My kids love riding the trains when we visit bigger cities so I can definitely see this being a hit! It’s just such a fun way to get a mini adventure on your way to the bigger adventure! This train looks perfect for kids! It also looks so clean and easy to use! What a great adventure to the International District – so fun! Yes, it was an easy adventure with the kids and they had so much fun! I have always wanted to ride a train! Hopefully one day! Yes! Find an opportunity and seize it! What a fantastic fun trip your family had. I absolutely LOVE train rides, I remember taking one from Houston to Louisiana when I was a kid. Great memories, great moments for the little ones to experience. Love you post – Thanks so much for sharing! Ooh! Louisiana is on my travel bucket list! I’ve never actually spent time in Chinatown, so I’ll have to check out some of these places! I live in Shoreline so have to catch the Lightrail at Westlake, but I need to start taking it more. I’m pretty excited for the new Light Rail stations that will be built at some point! Especially from the Eastside. I just hate paying for parking in Seattle! What a magical way to get to Disney! I love it! This is such a cool idea for the kids! I will definitely have to remember this for the next time I am in the area, my kids would love the train! It’s just so easy for parents and kids think it’s AMAZING! Win Win! 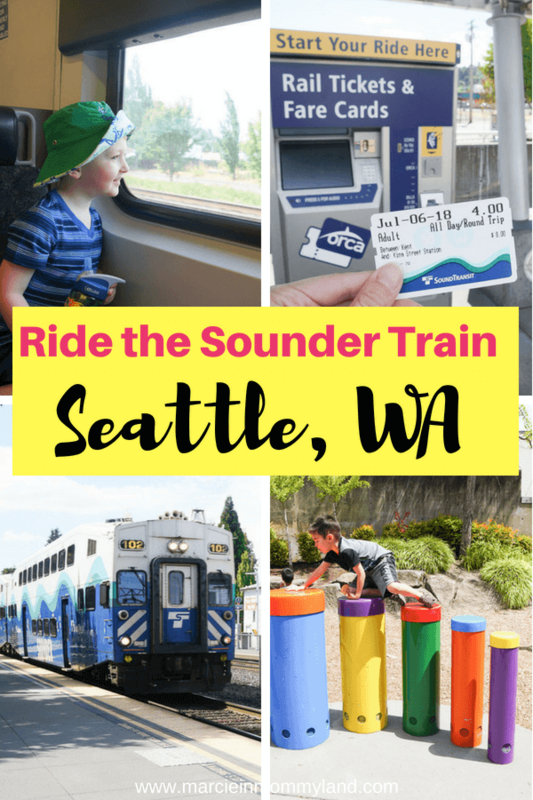 We’ve been wanting to ride the Sounder Train. What fun to see these photos! We’ll have to do this when we get back to Seattle. Yes! Maybe they will even have new routes! Had no idea this existed! I have to admit I have never been to the International District of Seattle, but this seems like an easy way to make it over there! It’s definitely a great way to avoid parking!